Timetables for the tutorial and the workshop are now online, as are the abstracts of the workshop papers (choose from the menu to the right). The analysis of large sets of genetic data has a long tradition in biology. In recent years, methods developed in this field have also been successfully applied in the humanities, including linguistics (e.g. Warnow and Nichols 2008; McMahon and McMahon 2005), literary studies (e.g. Windram, Shaw, Robinson and Howe 2008) and anthropology (e.g. Tehrani, Collard and Shennan 2010). In these disciplines, phylogenetic methods have been used for the visualisation and analysis of data ranging from parallel texts and cognate word lists over manuscript traditions to diverse types of cultural artefacts. In order to advance these methods and discuss their application, we are holding a three-day event composed of a tutorial and a workshop. If you would like to participate, please register by October 20, 2012. For more details, choose the tutorial page to the right. 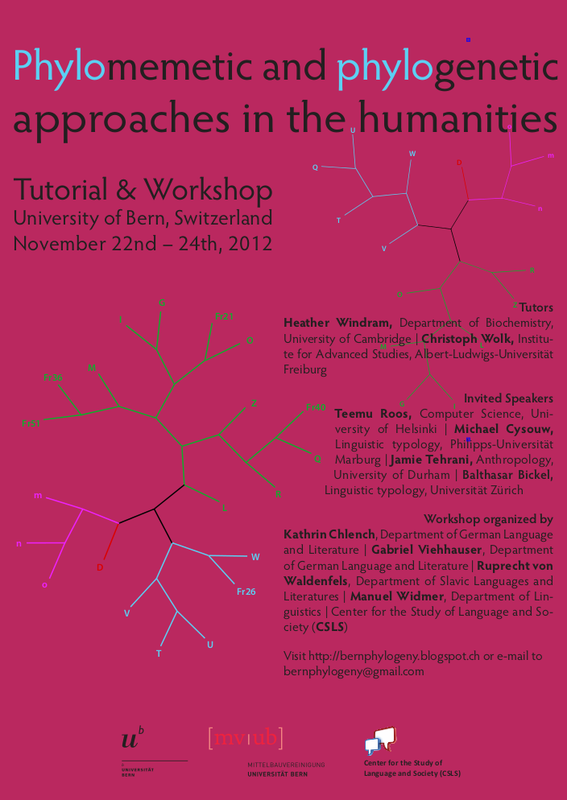 In the workshop on the next day, Nov 24, we would like to bring together both junior researchers and established specialists from different disciplines to discuss and exchange ideas about applications, benefits and limitations of "phylomemetics” (Howe and Windram 2011) in different disciplines and with different types of data in the humanities. 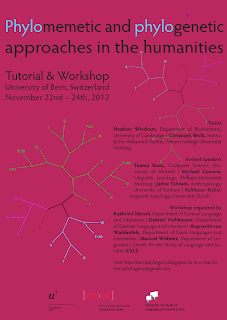 If you would like to participate with a paper, please send your abstract by October 16, 2012 (deadline extended). For more details, please visit the workshop page to the right. Nichols and Warnow (2008), Tutorial on Computational Linguistic Phylogeny. Language and Linguistics Compass, 2: 760–820. of phylogenetic methods in stemmatic analysis. LLC 23(4): 443-463.